We all get attached to our pets. My current dog a once wild dingo cross I wouldn’t give away for the world. 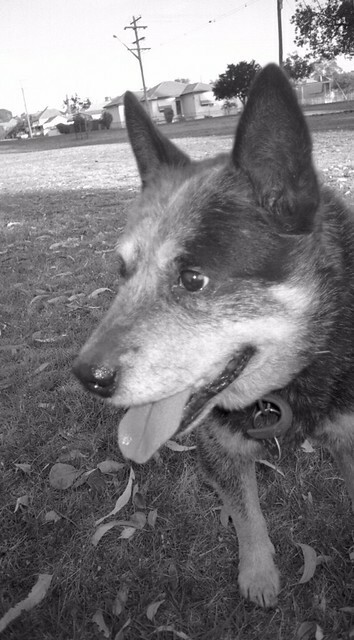 In 2004 Balzac my blue heeler died. He was an extraordinary dog. People rang up crying when they got the news. I recently had reason to find the email that I sent to friends and family back then. And even though it is self indulgent I decided to post it here. After all, it is my blog. Everybody has a best mate. I guess over the last thirteen and a bit years mine has been Balzac. From a pup on my spray deck paddling through the gravel rapids in the Yarra to swimming through them himself. Continually charging the back fence in Mount Waverley until it fell over, to get in the park and visit the neighbours. Then repeating it with three metres of chain attached to his collar after breaking the weakest link. He’s been brought home in a police divvy van after getting caught in peak hour traffic, flattening himself against the road as two vehicles drove over him, the third, a Police divvy van pulling up in time. He’s jumped out of the car window while doing 30-40 km/hr because he saw something interesting on the other side. Once, with the windows wound up and wanting to get out he charged the rear window of the station wagon exploding it outwards before calmly jumping out. Going for a drive was his favourite thing. Especially in the troopie where he can lie on a trunk behind my head and have a great view of the road ahead. He can never get enough. With my mates he has something that I call the wow factor. “Wow, can he fart” was usually the comment. After a weekend of us blokes exercising in the mountains, living off wholegrain and other healthy products, perhaps with Steve throwing in a bit of buckwheat, add on exercise and we could fart. On arriving home Balzac could put us all to shame just from being excited to see us. This impressed everyone so much that a yellow Mambo musical farting dog sticker was put on my car. He’s dragged some of my nephews and nieces behind him in a box with a chain pulled through it and attached to his collar – but forced to stop after several roll-overs on bends. He’s disturbed four thieves I know of. One time in Alphington he leaped from his couch on to the crook, and in Echuca I walked out to see him hanging a foot off the ground, his mouth around an ankle belonging to a lad who in turn was hanging off a high corrugated iron fence. To try and tame him and stop him from thinking himself top dog, I took him to Mal’s parents farm to have a tough farm dog sort him out. Poor Tex had to slink around the fences of his own farm. Mal wet himself when I threw the frisbee, Balzac spun around, accelerated to full pace all the while watching the frisbee – and ran into the fence. He still has that pink spot on his nose where the skin was ripped off. He enjoyed showing off his skill with cattle. Imagine a strike in a ten pin bowling lane. He has learnt not to play with geese and the fun you can have charging oncoming rams with a metal muzzle on. 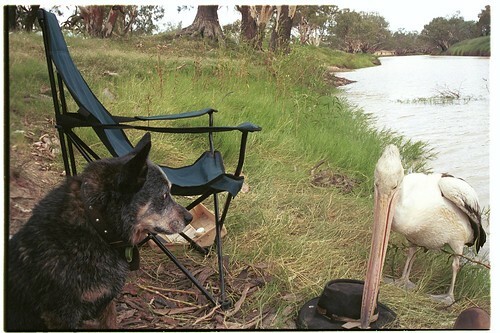 His best mate ever was a magpie called Henry and they went everywhere and did everything together. As a young dog he enjoyed swimming with me. Swimming around me in circles until I grabbed his tail and he pulled me in. At the age of nine he swam half way across the Murray to do the same thing when he noticed I wasn’t swimming so good after popping my shoulder. Going to the beach there was no better fun than running for miles snapping at oncoming waves until you swallow so much seawater you throw up in front of swimmers. He has jumped in an out of planes and jumping platforms with me as I practised skydiving. He has bitten my ankle until I have responded to him and he has shown me a smoke filled room and then willingly followed me in as I went to find out why. He never trusts me out of his sight. I still remember proving that to my sister in law when I hid from him and he ran up and down searching for me. He would charge my solid back door until the 60 year old metal latch bent and the door popped so he could get in. He never just accepted a pat. He gave as good as he got. usually with his tongue. As I started travelling, no matter what the weather, rain, cold or hot, no matter if his bed was protected from the elements, I could always put my arm out of the swag and know he was lying next to me. if he was not there, he would be standing between me and the place from whence came the noise that woke us. He has willingly followed me everywhere from into the air to under the ground to running over hot desert sands from bush to bush, collapsing on his side and from that position resting on his thick coat scooping the sand away so he could stand on something cooler ready for his sprint to the next bush. A couple of weeks ago Balzac looked like he had broken his leg. He had spinal arthritis. A large dose of cortisone eased the pain but he could not recover the use of his right leg, and his left leg was also affected. After a great Sunday where he chased the ball and loved a drive his condition worsened and he was suffering a lot of pain and unable to support himself. But he still repaid each pat, each time I held or carried him, with a lick. he was far from an ordinary dog, as loyal as you can get and I will miss him. I had Balzac put down earlier today. He is buried overlooking the sea near Balgowan where only a few weeks ago he was enthusiastically trying to find his way down a sheer ten metre drop to the beach so he could chase the waves. The August 2010 Residential Aged Care Communiqué is out. Well it has been out for a while. This is a great resource that highlights selected cases that have been reported to the State Coroner’s Office that may interest the Aged Care Community. You can subscribe by email at the Victorian Institute of Forensic Medicine with the communiqué becoming available online much later. • To improve the awareness of clinicians, health workers, carers and those in positions of governance about adverse events resulting from systems failures. Lessons from past cases can then be applied to their own institutions. • To improve residential aged care workers’ understanding of the coronial system and the work performed by the Clinical Liaison Service. This issue looks at two cases of residents with dementia. One resident wanders and the other repeatedly places objects in his mouth. One thing in common in these cases is how we become acclimatised to abnormal or dangerous behaviour. Initially we worry about the behaviour but over time we start to think of it as normal. This can lead to us not being as aware and also makes us slower to respond to change. This is the first edition of the Residential Aged Care Practice Change. Rather than looking at deaths in Aged Care facilities brought to the attention of the coroner it is looking at improvements resulting from changes in practice at individual Aged Care Services. The June Residential Aged Care Communiqué is out. This is a great resource that highlights selected cases that have been reported to the State Coroner’s Office that may interest the Aged Care Community. You can subscribe by email at the Victorian Institute of Forensic Medicine with the communiqué becoming available online much later. The download is below as it is not yet available on the website. This issue looks at deaths arising from two commonly used and we would think benign pieces of equipment. A urinary catheter and a hot water bottle. There are many contributing factors all being the usual suspects. Communication, following policy and protocols and training amongst others.